TRUCKEE – THE TALK OF THE TOWN. Step into any of the stores, bars and cafes along Truckee’s Donner Pass Road (also known as the main drag) and you’re likely to see a few black and white photos hanging on the walls. 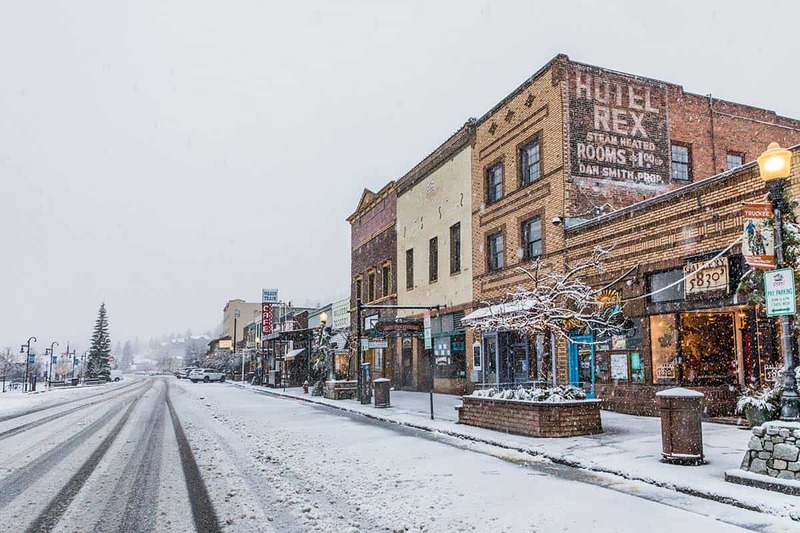 They’re images of Truckee’s days gone by, a history that locals still cherish, even as their town has grown from being a railway stop to becoming a destination that has graced the pages of magazines touting its connections to skiing, shopping, dining, and life itself. In fact, the Wall Street Journal recently featured Truckee in an article about, “The Coolest, Under-the-Radar Ski Towns in the American West.” The Matador Network ratcheted up the praise when it named Truckee its “#1 Coolest Ski Town In North America” for 2018. Whether they welcome the plug or not, most locals would proudly nod their heads in agreement. Truckee has grown up. While Truckee’s history is commonly associated with 1846 when the Donner-Reed Party was tragically trapped along the lake that now bears the Donner name, the area’s significance was in play far earlier in time. Native American tribes that include the Washoe, Shoshone and Paiute frequented this stretch of water and meadows for hunting and trade as early as 3,000 B.C. The discovery of gold kicked activity into high gear, establishing the settlement as an outpost known then as Coburn Station. Perhaps the longest-lasting impact came when – through the efforts primarily made up of Chinese immigrants – the Transcontinental Railroad blasted through the granite cornices of the Sierra en route to Promontory Point. The presence of the railroad – along with the lumber mills in the region – defined early Truckee and Amtrak continues to roll through town on its daily travels between Chicago and San Francisco. That history is now in the process of being transformed into a scene that goes well beyond rails and warehouses and looks to be its next center of attention. The Truckee Railyard is one of California’s most prominent development projects, opening up the east side of town with a creative gathering of shops, offices, homes, restaurants, and a theater. The addition of this chapter to Truckee’s history adds to its appeal for visitors traveling to and from Lake Tahoe or who see the city as their new High Sierra destination. Truckee has long been a base camp for more than trains and cars and wayward pioneers. It’s also been a scene for those who heed the call of the great outdoors, Olympians and everyday adventurers alike. One of the earliest to see the wintertime potential of the area was none other than Walt Disney who – in 1939 – saw the potential of the resort that would welcome California’s first chairlift and the west’s first gondola. Twenty-one years later, Squaw Valley would host the VIII Winter Olympic Games. 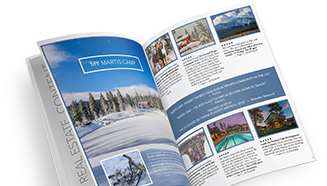 Today, you can reach eight ski resorts in less than 30 minutes from Truckee, a convenience not lost on those who move here to elevate their skills to championship level. That level of competition exists here for bikers as well – both single track fans and road warriors alike. And those who like the thrills of a pump track, dirt jumps, flow lines, dual slalom and drop zones will find their fix at Truckee’s highly-touted Bike Park. Find yourself heading a few minutes west of town en route to Donner Pass and you’ll find climbers tackling the granite walls. Meantime, another minute up the road, you’ll encounter hikers traversing the Pacific Crest Trail on their three-month treks to the Canadian border. Others are content to rip off one, two or five miles for the day and head to the area’s many peaks, lakes and meadows. Then again, feel free to pull up to a beach or find a pier and spread out the picnic on Donner Lake. There’s great boating, fishing, kayaking and paddleboarding here as well. Of course, if one is to indulge in things that involve bikes, boots, boards and bindings, there surely must be some sort of reward that doesn’t involve huffing and puffing. Shopping, for example. As well as cafes, coffee shops, pubs and restaurants. In which case, Truckee excels. The town whose main street still sports buildings stretching back to its early days is busy with people in search of art, antiques, furniture, clothes, toys and books. Its south-facing sidewalk warms shoppers who freely wander from one charming store to the next. And when shopping – like skiing, hiking and skating – demands a break, there are restaurants serving up everything from exquisite steaks to fine fish to pastas, salads and dishes that satisfy the most demanding diners. This so-called “secret find” of a town is not so secret to those who’ve seen Truckee mature. The river continues to slide through town, the buildings have maintained their charm, and you can still rely on the possibility of a traffic jam compliments of the Southern Pacific Railroad, but the allure of the little town at the base of the Sierra is being graced and enhanced by projects big and small, all of which make it a destination ideally suited for those Martis Campers who are little more than five minutes away.